Being Retro: C2E2 : Wonder Twin Powers... Activate! I wanted to let you know I am sharing all of our images and video that we were able to get, this whole week and it would be awesome for you to take a look. Some great people in some awesome costumes, except that darn photo bomber... lol. I will be back shortly and renewed posting powers, so please stick around and around and around. Wonder Twins! They were a favorite of mine. Man, they put some time into those customs! 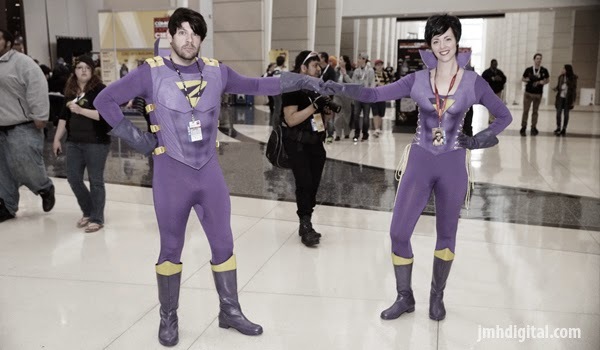 It's crazy to think somebody would walk around as the wonder twins. You know I love this one Jeremy! What a wonderful experience. Love those purple costumes! And the Love Shack is a fun song! Never heard of the Wonder Twins.